Where: Park City Cemetery, 1300 Kearns Blvd. On a stormy night on November 17, 1941, an Army Air Corps B-18 bomber crashed into the side of Iron Mountain, killing two and wounding five. Please join us on Memorial Day, May 28, at the Park City Cemetery, for a memorial service to remember this tragedy. 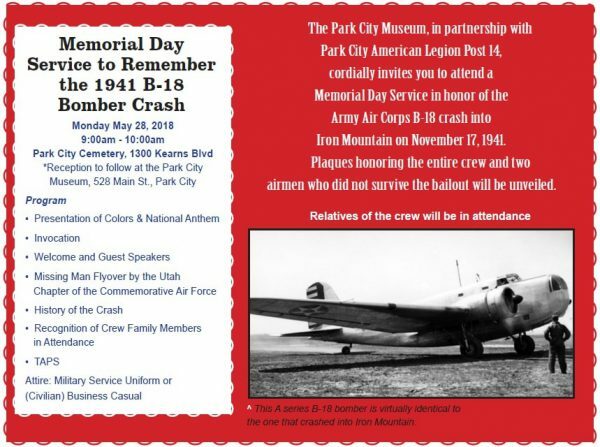 This service is presented in partnership with the Park City American Legion Post 14. The program will feature a presentation of colors and the national anthem, an invocation, guest speakers, a Missing Man flyover by the Utah Chapter of the Commemorative Air Force, a history of the crash, recognition of crew family members in attendance, and Taps. Plaques honoring the entire crew and two airmen who did not survive the crash will be unveiled. A reception will follow at the Park City Museum at 528 Main Street. Attire is military service uniform or civilian business casual.